Here are luxurious Beverly Hills hotels that offer a wide range of services including 24-hour concierge to complimentary chauffeured Rolls Royce. You won't be surprised when you spot your favorite celebrity at one of them! The most historic place to stay is the Beverly Hills Hotel which is kid friendly and the Beverly Hills Hilton were the Golden Globes are held annually. The only AAA Diamond Award hotel in Los Angeles is the Peninsula Beverly Hills and the Beverly Wilshire-Beverly Hills, a Four Seasons Hotel which was featured in Pretty Woman as well as the Montage Beverly Hills offer superb services. There are trendy boutique properties such as the SIXTY Beverly Hills and the Viceroy L'Ermitage Beverly Hills is perfect for trendy adults with children. The Avalon Hotel Beverly Hills boasts excellent value and the newest addition to Beverly Hills is the Waldorf Astoria Beverly Hills which opened in 2017. When you are searching for one of the best luxury Beverly Hills hotels that offer superb amenities during your stay then the Montage Beverly Hills is an ideal choice. Located in the Golden Triangle within Beverly Hills, the Montage Beverly Hills is frequented by celebrities and offers almost everything on 24-hour basis. The Montage Beverly Hills has a Spanish Colonial nine story architectural design with 201 rooms and suites which feature an eclectic Antique California decor. There ae five styles of guestrooms which range in size from 480 to 550 square feet with large sitting areas and the Premier as well as the Garden guestroom are available with a balcony. The smallest one-bedroom suite is the Executive at 625 square feet with a balcony. There are five other styles of one-bedroom suites that range in size from 875 to 2,025 square feet each with 1.5-bathrooms and some feature kitchenettes as well as three categories offer balconies. Many of these suites can be combined with the Montage suite to create massive living areas of over 5,000 square feet. There are also four residence suites that range from one to four-bedrooms and feature multiple baths, wine cellars as well as gourmet kitchens. The Montage Beverly Hills hotel has a superb spot for exploring Los Angeles with the Farmer's Market, Melrose Avenue and the Hollywood Walk of Fame within a 3-mile distance. The Montage Beverly Hills also provides a complimentary Mercedes Benz for each you to drive. The property has an excellent rooftop freshwater swimming pool that features cabanas with poolside service, a fitness center and a full service spa. Dining at the Montage Beverly Hills begins with breakfast and lunch at Georgie as well as the Rooftop Grill and dinner is served at Georgie. Dining offsite is plentiful within walking distance including Spago Beverly Hills, Bouchon Bistro prepare French cuisine and 208 Rodeo Restaurant serves Italian. Nightlife is a quiet drink at the Garden Bar or Euro10 and Sunset Strip is only a 10-minute drive where you will find the Roxy Theatre or Whiskey a Go Go for live music. If you are looking for an iconic luxury Beverly Hills hotel that is family friendly and a spot for many celebrities then the historic Beverly Hills Hotel is a superb selection. 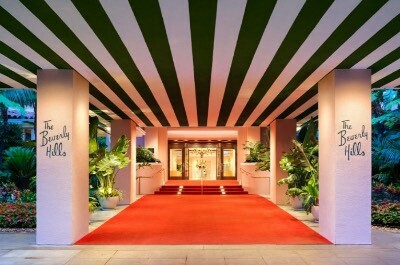 Located on Sunset Strip northwest of Beverly Hills and 5-nimutes from Rodeo Drive, the Beverly Hills Hotel is set on 12-acres of lush gardens, was the first historic landmark created in Beverly Hills and all concierges are members of prestigious Les Clefd'Or concierge institute. Constructed in 1912 the Beverly Hills Hotel has a Mediterranean Revival four story architectural style with 204 rooms and suites that sport a fresh contemporary decor. Bungalow, Superior and Deluxe rooms range in size from 400 square feet to 525 square feet and are available with or without a balcony. There are four styles of junior suites that range from 615 to 725 square feet with an integrated sleeping/living area and some have a patio. There are six categories of one-bedroom suites that range in size from 654 to 825 square feet with the Garden, Beverly Hills, Sunset and Bungalow model offering a private patio or balcony. The hotel has seven other styles of larger one-bedroom suites that are between 1,050 to 1,445 square feet with the Deluxe Bungalow, Grand Deluxe, Premier and the Paul Williams suites boasting patios or balconies. The other six categories of one-bedroom suites range from 1,200 to 2,033 square feet with private balconies or patios, full kitchens and Bungalow 5 as well as the Presidential suite sport a private pool. The Beverly Hills Hotel is a perfect spot to start your adventures with several attractions within a 25-minute drive such as Universal Studios Hollywood, the Hollywood Walk of Fame as well as the Hollywood and Highland Center. The hotel also offers complimentary car service within a 3-mile radius of the property. The Beverly Hills Hotel has a freshwater swimming pool which is surrounded by cabanas, a fitness center and a full service spa. Dining options at the hotel include the Polo Lounge which serves all three meals and the Cabana Cafe serves breakfast and lunch poolside. Dining selections offsite within walking distance include Mastro's Steakhouse, Piccolo Paradiso for Italian and Wally's Vinoteca prepares American fusion. Nightlife begins onsite at the Polo Bar and Bar Nineteen 12 or you can catch a show at the Hollywood Palladium as well as along Sunset Strip which are a short drive away. When you are seeking the best luxury Beverly Hills hotel which is a favorite with celebrities then you need to stay at the Peninsula Beverly Hills. 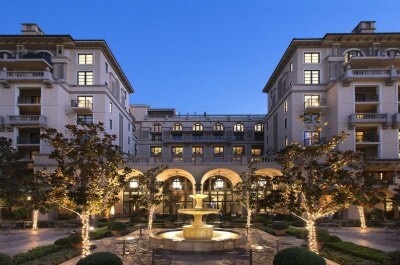 Located between Century City and Beverly Hills, the Peninsula Beverly Hills is situated on 9-acres within a secluded garden and has won the AAA 5 Diamond Award for 24 consecutive years. The Peninsula Beverly Hills has a Colonial five story architectural style with 195 rooms as well as suites which were refurbished in 2011 and feature a contemporary Asian decor. Superior and Deluxe rooms are sized at 480 square feet with a choice of bedding and Garden Deluxe rooms have 560 square feet with a private garden balcony. Villa rooms have 585 square feet with an integrated sleeping/living area that features a sofa sleeper, fireplace and some rooms have private patios. Grand Deluxe rooms have 619 square feet with a choice of bedding and the Executive Grand Deluxe is 700 square feet with an integrated sleeping/living area with a sofa sleeper. The Beverly, Superior and Garden one-bedroom suites feature 750 square feet with the Garden suites boast an additional 1,000 square feet private patio. The Villa, California and Deluxe one-bedroom suites range in size from 825 to 1,150 square feet and some Deluxe suites have a balcony as well as some Villa suites have kitchenettes and Jacuzzis. Grand Deluxe and Royal Patio suites feature 1,500 to 2,250 square feet with a full kitchen and private balcony. The Peninsula suites and Villas range from 2,250 to 2,336 square feet with one or two-bedrooms and a full kitchen. The Peninsula Beverly Hills hotel is ideally located with a short drive to Rodeo Drive, Hollywood Walk of Fame and to Venice Beach. 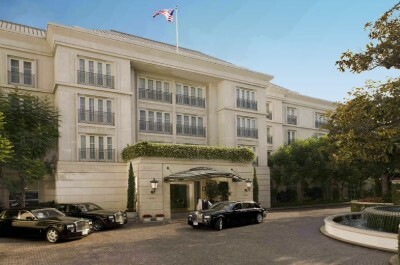 The Peninsula Beverly Hills boasts complimentary Rolls Royce car service within a selected range of the hotel. The property features a rooftop freshwater swimming pool with cabanas and poolside service, a fitness center as well as a full service spa. Dining at the Peninsula Beverly Hills can be for all three meals at the AAA 5 Diamond Award Belvedere Restaurant and the Roof Garden Restaurant. Offsite dining within walking distance includes Spago Beverly Hills, Il Pastaio for Italian and Grill on the Alley for steaks. Nightlife includes a nice libation at the Club Bar or a trip to Sunset Strip where you will find several live music venues. If you are looking for a classic luxury Beverly Hills hotel which is perfect for all type of travelers then you should try the Beverly Hilton. Located in central Beverly Hills at the intersection of Wilshire and Santa Monica Boulevards, the Beverly Hilton is the home of the Golden Globes and has hosted thousands of celebrities over the years. The Beverly Hilton has a Moderne eight story architectural design and contains 570 rooms as well as suites which boast a contemporary interior. Deluxe rooms in the Wilshire Tower are 344 square feet in size with a choice of bedding and some rooms have balconies while other feature large picture windows or floor to ceiling windows. Rooms in the Oasis Courtyard have 356 square feet with a choice of bedding, floor to ceiling windows and a terrace. Pool Deck and Pool Cabana rooms are 374 square feet with a choice of bedding and a balcony. Luxury rooms are sized at 450 square feet with floor to ceiling windows and private balcony. Studio suites have 500 square feet with an integrated sleeping/living area, floor to ceiling windows and a balcony. One-bedroom Executive suites are sized at 560 square feet with a separate living room, floor to ceiling windows and a private balcony. One-bedroom Luxury suites are 980 square feet with a separate living room, floor to ceiling windows and private balcony. Other one-bedroom suites include the Governor suite at 1,215 square feet and the Presidential Suite has 1,870. Both of these can be connected to other suites for more sleeping space. The Beverly Hilton allows for easy access to many of the areas attractions such as a 10-minute walk to Rodeo Drive or a 15-minute drive to Hollywood Boulevard as well as a 25-minute drive to Santa Monica State Beach and there is also complimentary car service available. 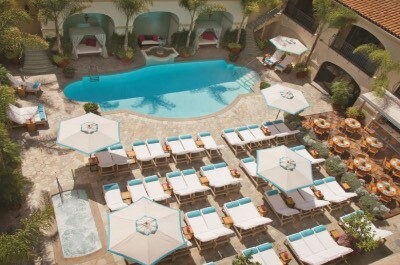 The Beverly Hilton has the largest freshwater swimming pool in Beverly Hills and is complete with poolside service. The property has a fitness center and full service spa. Dining at the Beverly Hilton includes Circa55 which is available for all three meals. Offsite dining choices within walking distance are Joss Cuisine for Asian, the Belvedere serves Mediterranean dishes and Da Pasquale prepares Italian. Nightlife consists of a cold libation onsite at Trader Vic's or you can take a 2-mile drive to Sunset Strip where you will find the Laugh Factory. When you are searching for trendy luxury boutique Beverly Hills hotel that is ideal for couples or younger adults then the SIXTY Beverly Hills is a fantastic choice. Located in the heart of Beverly Hills along Wilshire Boulevard, the SIXTY Beverly Hills is situated only 5-blocks from Rodeo Drive and less than 2-miles from the Sunset Strip. The SIXTY Beverly Hills has a modern eight floor architectural style with 107 rooms and suites which boast a sleek heavy wood decor. Rooms are sized between 220 to 250 square feet with a choice of bedding, floor to ceiling windows and a French balcony. Studios are slightly larger at 275 square feet with a French balcony. One-bedroom suites range in size from 400 to 440 square feet with a separate living room, floor to ceiling windows and two French balconies. The one-bedroom SIXTY suite is 850 square feet with a separate living room, a kitchenette, floor to ceiling windows and three French balconies. The Penthouse suite is one-bedroom at 1,100 square feet with a separate living and dining room, 2-bathrooms, kitchenette, floor to ceiling windows as well as four French balconies. The SIXTY Beverly Hills is a conveniently located within 30-minutes to several attractions such as Venice Beach, Santa Monica State Beach and the Los Angeles Farmer's Market. 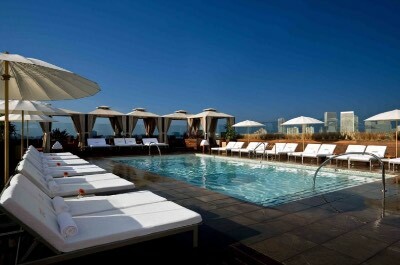 The SIXTY Beverly Hills has a splendid rooftop freshwater swimming pool with a beautiful sundeck as well as poolside service, fitness center and a full service spa. Dining onsite includes Caulfield's Bar and Dining Room for all three meals as well as the Above Sixty Beverly Hills which serves lunch and dinner at the rooftop pool area. Dining selections offsite within walking distance is numerous with Frida Mexican Cuisine, 208 Rodeo Restaurant for Italian and Grill on the Alley prepares steaks. Nightlife can include a drink at the Above Sixty Beverly Hills overlooking the area or you can walk to the #1 Magic Show in L.A. as well as Nic's Martini Lounge. If you are looking for a superb luxury Beverly Hills hotel that is fresh and perfect for all types of travelers then you should stay at the Waldorf Astoria Beverly Hills. Located in Beverly Hills along at Wilshire and Santa Monica Boulevards, the Waldorf Astoria Beverly Hills opened in the summer of 2017 and was designed by the legendary Pierre-Yves Rochon. The Waldorf Astoria Beverly Hills has a modern Art Deco twelve story architectural design with 170 rooms and suites that feature an elegant contemporary decor. All rooms and suites have floor to ceiling windows as well as a private terrace with varying views of the surrounding area Wilshire Boulevard to Beverly Hills to Hollywood. Deluxe and Superior rooms have similar layouts with 537 square feet and a choice of bedding. Beverly Hills rooms have 613 square feet with a choice of bedding and additional outdoor living space. There are thirteen categories of suites which start with the one-bedroom Wilshire which features two distinct floorplans with 696 square feet a choice of bedding and a separate living. The one-bedroom Century offers 775 square feet with a larger outdoor space. The one-bedroom Hollywood features 1,103 square feet of space with a smaller outdoor space. Villa suites range in size from 1,039 to 1,640 square and feature circular terraces that range from 740 to 1,068 square feet. The one-bedroom Beverly Hills suite has 1,093 square feet with 1.5-bathrooms and a large circular terrace with 360 degree views. 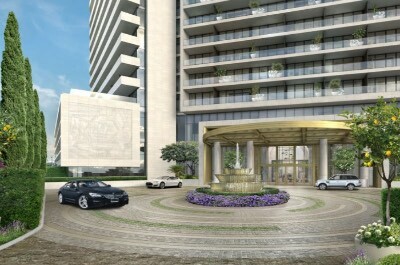 There are four distinct one-bedroom penthouse floorplans which range from the Astoria at 1,103 square feet to the Waldorf at 1,263 square feet to the Governor at 1,779 square feet and the Presidential penthouse is 3,215 square feet with an additional 1,459 square feet of outdoor living area. The Waldorf Astoria Beverly Hills has a great location to begin your adventures with Rodeo Drive only a short walk away and you are less than 30-minutes from Santa Monica State Beach as well as Griffith Park. The Waldorf Astoria Beverly Hills has a fantastic rooftop freshwater swimming pool with poolside service, a fitness center and a full service spa. Dining onsite includes the Lobby Lounge for breakfast, the Rooftop by JG serves lunch and dinner as well as the Jean-Georges Beverly Hills prepares exquisite dinners. Nightlife can include a drink at the Main Cocktail Bar or at the Rooftop by JG. The Beverly Wilshire-Beverly Hill, a Four Seasons Hotel is one of the most luxurious Beverly Hills hotels for all types of travelers from romantic couples to families. Located in the heart of Beverly Hills across the street from Rodeo Drive, the Beverly Wilshire-Beverly Hills, a Four Seasons Hotel is well-known for being the prominent hotel used for filming the movie Pretty Woman starring Richard Gere and Julie Roberts. The Beverly Wilshire-Beverly Hills, a Four Seasons Hotel was constructed in 1928 with an Italian Renaissance style that features fourteen floors which contain 395 rooms and suites that boast an elegant contemporary decor. Signature rooms have 400 square feet with a choice of bedding, floor to ceiling windows and some offer a private balcony. Studios are sized at 600 square feet with integrated living/sleeping space, large picture windows and a choice of bedding. There are five styles of one-bedroom suites that range in size from the Beverly at 750 square feet to a Corner Beverly suite at 950 square feet some of these suites offer a private balcony. There are six specialty suites with one-bedroom range in size from 750 to 1,425 square feet and are complete with a private balcony or terrace. The two-bedroom Governor, Beverly Presidential as well as the Wilshire Presidential suites range in size from 2,200 to 4,000 square feet of space and the Presidential suites has a kitchenette. The three-bedroom Penthouse is 5,000 square feet with a media room, separate living and dining rooms, a kitchen and 3.5-bathrooms. The Beverly Wilshire-Beverly Hills, a Four Seasons Beverly Hills hotel is perfectly located to start your adventure with 20-minute drives to Hollywood Walk of Fame, Universal Studios and Santa Monica State Beach. You also have access to a complimentary car ride within 3-miles of the hotel. The property has a gorgeous freshwater swimming pool with sundeck and poolside bar, a fitness center as well as a full service spa. Dining at the Beverly Wilshire-Beverly Hills, a Four Seasons Hotel includes the BLVD which prepares all three meals and the CUT which was designed by Wolfgang Puck offers dinner. Nightlife includes a drink at the BLVD and CUT lounge or you can take a 2-mile drive to the famous Sunset Strip for a variety of entertainment venues. When you are seeking a secluded luxury Beverly Hills hotel that is great for younger families with children as well as jet setting couples then the Viceroy L'Ermitage Beverly Hills is an ideal selection. 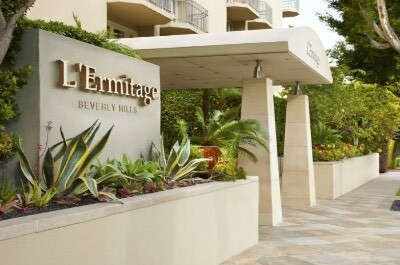 Located in a secluded residential neighborhood within Beverly Hills, Viceroy L'Ermitage Beverly Hills is a 5-minute drive to Rodeo Drive and less than 10-minutes to the Hollywood Walk of Fame. The Viceroy L'Ermitage has a modern eight story architectural design with 114 suites which were renovated in 2015 and feature a contemporary chic decor. Each suite boasts a private balcony with garden or city views and a separate dressing room. Viceroy junior suites are sized at 650 with an open floorplan with an L-shaped sofa. Viceroy studios range in size from 675 to 700 square feet with a choice of bedding within an open floorplan and an L-shaped sofa. The one-bedroom Beverly and Icon suites have 1,200 square feet of space with a separate living room, kitchenette, 2-bathrooms and 2-balconies. The one-bedroom Royal suite has 2,200 square feet with a separate living room, dining area, 1.5-bathrooms, kitchenette and 3-balconies. The one-bedroom Presidential suite is massive at 3,700 square feet with a separate living room, separate dining room, kitchenette, study/game room, 2.5-bathrooms and 5-balconies. The Viceroy L'Ermitage Beverly Hills is within a short drive to many fantastic attractions such as Melrose Avenue, the Greystone Mansion and Park as well as the Sunset Strip. Children will enjoy the Zimmer Children's Museum, the Los Angeles Farmer's Market and American Girl Place is within 2-miles of the property. 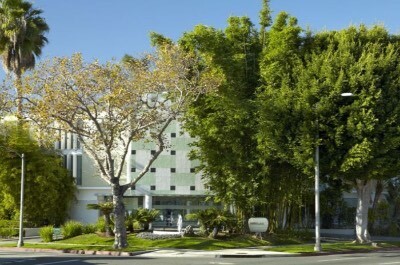 The Viceroy L'Ermitage Beverly Hills hotel offers complimentary local car service and baby strollers to guests. The property has a stunning rooftop freshwater swimming pool which has a sundeck with a 360 degree view, a fitness center and a full service spa. Dining onsite includes Avec Nous which features a French bistro for all three meals. Offsite dining options within walking distance are numerous with Il Pastaio for Italian, Mastro's Steakhouse and the Bouchon Bistro prepares European cuisine. Nightlife within walking distance includes the Abbey, Doug Weston's Troubadour or you can try the Buena Vista Cigar Club. The Avalon Hotel Beverly Hills is a fantastic choice for a value boutique Beverly Hills hotel that is perfect for couples and trendy adults. Located in a quiet residential neighborhood south of Beverly Hills, the Avalon Hotel Beverly Hills is within a 15-minute walk to Rodeo Drive and less than 4-miles to Melrose Avenue. The Avalon Hotel Beverly Hills is composed of three unique circular Moderne style buildings with 84 rooms and suites that boast a retro-chic interior. The Olympic building contain four style of rooms and suites with Avalon Premier rooms that are spacious rooms with floor to ceiling windows, a choice of two double beds or one queen size bed (some of the queen rooms have balconies overlooking the pool). Avalon Junior suites are more spacious with floor to ceiling windows and an open floorplan that includes an alcove sitting area (some have balconies). Avalon one-bedroom suites are 850 square feet with a separate living room and floor to ceiling windows. Canon Queen rooms are large with an alcove sitting area and Studios have an open floorplan with an alcove sitting area as well as a kitchenette (first floor units have patios). Rooms in the Beverly building offer a choice of bedding and floor to ceiling windows in most units (a patio is available in some king bed units). The Penthouse suite is 885 square feet with one-bedroom, a separate living room as well as a Murphy bed, 2-bathrooms and 2-balconies which boast an additional 1,000 square feet of outdoor living space. The Avalon Hotel Beverly Hills is a superb place to start your adventures with the Museum of Tolerance within walking distance and you are 2-miles from the Petersen Automotive Museum as well as the Pacific Design Center. Other options include using a complimentary bicycle to find your favorite celebrities home. 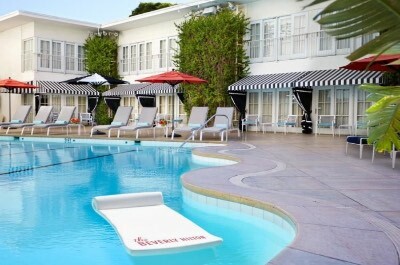 The Avalon Beverly Hills hotel has a fantastic hour glass shaped freshwater swimming pool that is lined with cabanas which offers poolside service, a fitness center and in-room spa treatments are available. Dining at the hotel includes the Viviane which prepares California fusion for all three meals. Selections offsite for dining within walking distance include the Urth Cafe, Spago Beverly Hills and Piccolo Paradiso serves Italian. Nightlife within walking distance includes the #1 Magic Show in L.A., Nic's Martini Lounge and the Club Bar at the Peninsula.